A remarkable schism is developing between audiologists in the UK and the USA on the topic of auditory processing disorder (APD) in children. In 2010, the American Academy of Audiology published clinical practice guidelines for auditory processing disorder. In 2011, the British Society of Audiology published a position statement on the same topic, which came to rather different conclusions. This month a White Paper by the British Society of Audiology appeared reaffirming their position alongside invited commentaries. In 2006, David Moore, Director of the Medical Research Council’s Institute of Hearing Research in Nottingham, created a stir when he published a paper arguing that APD diagnosis should be based on performance on non-linguistic tests of auditory perception. Moore’s concern was that tests such as SCAN-C, which use speech stimuli, can’t distinguish an auditory problem from a language problem. I made similar arguments in a blog post written last year. Consider the task of doing a speech perception test in a foreign language: if you don’t know the language very well, then you may fail the test because you are poor at distinguishing unfamiliar speech sounds or recognising specific words. This wouldn’t mean you had an auditory disorder. A recent paper by Loo et al (2012) provided concrete evidence for this concern. They compared multilingual and monolingual children on performance on an APD battery. All children were schooled in English, but a high proportion spoke another language at home. The child’s language background did not affect performance on non-linguistic APD tests, but had a significant effect on most of the speech-based tests. Overall, Moore et al found that if we use auditory measures that are carefully controlled to minimise effects of task demands and language ability, we find that they don’t identify children about whom there is clinical concern. Nevertheless, children exist for whom there is a clinical concern, insofar as the child reports difficulty in perceiving speech in noise. So how on earth are we to proceed? In the White Paper, the BSA special interest group suggest that the focus should be on developing standardized methods for identifying clinical characteristics of APD, particularly through the use of parental questionnaires. The experts who responded to Moore and colleagues took a very different line. The specific points they raised varied, but they were not happy with the idea of reliance on parental report as the basis for APD diagnosis. In general, they argued for more refined measures of auditory function. Jerger and Martin (USA) expressed substantial agreement with Moore et al about the nature of the problem confronting the APD concept. “There can be no doubt that attention, memory, and language disorder are the elephants in the room. One can view them either as confounds in traditional behavioral tests of an assumed sensory disorder or, indeed, as key factors underlying the very nature of a ‘more general neurodevelopmental delay’” . They rejected, however, the idea of questionnaires for diagnosis, and suggested that methods such as electroencephalography and brain imaging could be used to give more reliable and valid measures of APD. Dillon and Cameron (Australia) queried the usefulness of a general term such as APD, when the reality was that there may be many different types of auditory difficulty, each requiring its own specific test. They described their own work on ‘spatial listening disorder’, arguing that this did relate to clinical presentation. The most critical of Moore et al’s arguments were Bellis and colleagues (USA). They implied that a good clinician can get around the confound between language and auditory assessments: “Additional controls in cases in which the possible presence of a linguistic or memory confound exists may include assessing performance in the non-manipulated condition (e.g. monaural versus dichotic, nonfiltered versus filtered, etc.) to ensure that performance deficits seen on CAPD tests are due to the acoustic manipulations rather than to lack of familiarity with the language and/or significantly reduced memory skills.” Furthermore, according to Bellis et al, the fact that speech tasks don’t correlate with non-speech tasks is all the more reason for using speech tasks in an assessment, because “in some cases central auditory processing deficits may only be revealed using speech tasks”. Moore et al were not swayed by these arguments. They argued first, that neurobiological measures, such as electroencephalography, are no easier to interpret than behavioural measures. I’d agree that it would be a mistake to assume such measures are immune from top-down influences (cf. Bishop et al, 2012) and reliability of measurement can be a serious problem (Bishop & Hardiman,2010). Moore et al were also critical of the idea that language factors can be controlled for by within-task manipulations when speech tasks are used. This is because the use of top-down information (e.g. using knowledge of vocabulary to guess what a word is) becomes more important as a task gets harder, so a child whose poor language has little impact on performance in an easy condition (e.g. listening in quiet) may be much more affected when conditions get hard (e.g. listening in noise). In addition, I would argue that the account by Bellis et al implies that they know just how much allowance to make for a child’s language level when giving a clinical interpretation of test findings. That is a dangerous assumption in the absence of hard evidence from empirical studies. So are we stuck with the idea of diagnosing APD from parental questionnaires? Moore et al argue this is preferable to other methods because it would at least reflect the child’s symptoms, in a way that auditory tests don’t. I share the reservations of the commentators about this, but for different reasons. To my mind this approach would be justified only if we also changed the label that was used to refer to these children. 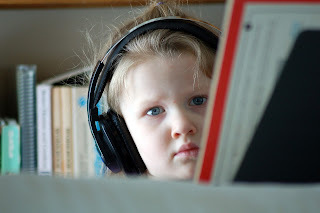 The research to date suggests that children who report listening difficulties typically have deficits in language, literacy, attention and/or social cognition (Dawes & Bishop, 2010; Ferguson et al, 2011). There’s not much evidence that these problems are usually caused by low-level auditory disorder. It is therefore misleading to diagnose children with APD on the basis of parental report alone, as this label implies a primary auditory deficit. In my view, we should reserve APD as a term for low-level auditory perceptual problems in children with normal hearing, which are not secondary consequences of language or attentional deficits. The problem is that we can’t make this diagnosis without more information about the ways in which top-down influences impact on auditory measures, be they behavioural or neurobiological. The population study by Moore et al (2010) made a start on assessing how far non-linguistic auditory deficits related (or failed to relate) to cognitive deficits and clinical symptoms in the general population. The study by Loo et al (2012) adopts a novel approach to understanding how language limitations can affect auditory test results, when those limitations are due to the child’s language background, rather than any inherent language disorder. The onus is now on those who advocate diagnosing APD on the basis of existing tests to demonstrate that they are not only reliable but also valid according to these kinds of criteria. Until they do so, the diagnosis of APD will remain questionable. Thank you for this excellent post! From my vantage point (as a school psychology researcher in the US), it certainly seems that the evidentiary burden is on proponents of APD as a construct and a diagnostic label, and that burden hasn't come close to being met. Part of the problem seems to be that audiologists' primary assessment expertise is in assessing hearing sensitivity, a practice that involves very different technical measurement issues than the assessment of auditory processing does. As such, many audiologists are not very aware of psychometric theory, let alone the issues that can affect performance on cognitive tests. In particular, there's a common view that if a test (such as the SCAN) is developed and marketed for certain uses, it's like a piece of standard audiologic equipment - it's thought to have been vetted. When I was criticizing the SCAN at one convention (ASHA), more than one audiologist asked me, "Then how could they have published the test?" Finally, I'm sympathetic to your definition of APD, but do we have much evidence that any children would meet it? That is, do we have clear evidence of a population of children who have normal peripheral hearing sensitivity and no general language or attention problems, but who nonetheless fail tests of low-level auditory processing? Thanks for your comment; glad to see the blog readership is extending across the Atlantic. I have indeed found your paper on this topic v. useful. Overall, I guess I am just being cautious because it seems to me feasible that you *could* have a language problem that resulted from lower-level auditory deficit. It's just that our current assessments don't let you unambiguously demonstrate that. So while I am skeptical, I don't want to prejudge matters until it's been properly tested. I welcome this discussion. My team have attracted controversy in the UK for continuuuing to refer to a syndrome rather than specific disorder in adults. In our work we identified that illness perceptions (specifically beliefs around symptom conseqences) in adults determined help-seeking behaviour (and hence clinical labelling) to a greater extent than auditory factors. What do you think about the notion that this is a multifaceted syndrome rather than a specific deficit or disorder? Thanks Helen for your comment. My focus was solely on children. I don’t have experience with adult APD and it’s interesting to me to know if there is any continuity- i.e. do the adults you see have a history of APD in childhood? (Or conversely, has anyone followed up kids with an APD diagnosis to see if they present in adult ENT depts?) From very cursory acquaintance with the literature my impression is that these adults are often people who weren’t affected as children, but who start to complain of symptoms in adulthood, suggesting a different aetiology. Obviously, one big issue with adults is that there is a range of neurological pathologies that can cause auditory symptoms, but I assume your focus in on people in whom known causes have been excluded. I have to say I don’t like the label King-Kopetzky syndrome. This is for the same reason that I criticise medical-sounding labels for developmental disorders (see: http://deevybee.blogspot.co.uk/2010/12/whats-in-name.html). I think it can be misleading in implying that we are dealing with a disease entity with a known cause. Nevertheless, I am intrigued by the associations you have identified between APD complaints in adults and illness perception. And there is no doubt that a syndromic label gets a condition taken more seriously. In children, I would stick with the conclusion we reached in Dawes and Bishop (2009), which was that APD should be seen as a symptom that could accompany a range of conditions, rather than a distinct syndrome. For adults, I’m less certain, but I agree that it makes sense to look beyond the auditory system for explanations. I can assure you APD doesn't just disappear when you become an "adult"! Oh no, that's just the start of your problems! Slander, blackmail, harassment, etc... you can look forward to all kinds of cr@p from certain predatory individuals as they seek to fill the "void"... because you cannot tell anyone you have APD if you've never heard of it. You cannot claim to be a victim if you don't know what you have. You cannot counter accusations if you don't know what you have You cannot explain what you have if you don't know what it's called. And there's no point trying to explain it to others as it can't possibly exist if they've never heard of it, especially the audiologists! You have to work harder and faster than others but you will still get the sack as you don't quite fit in. Almost no point getting a degree. APD trumps a degree every time! So what if there is a false positive diagnosis of APD? Is the audio training going to cause any long term harm? Does the audio training even work? OK, so you find out it was a false positive, simply go back and diagnose something else, or simply say we don't know! Plenty of other people will make false diagnoses about you. Your family will make false diagnoses. Your school "mates" will make false diagnoses. Your colleagues will make false diagnoses. Other "experts" will make false diagnoses, because they have never heard of APD., and you cannot refute any of it because you have never heard of APD either... not until 30 or so years later but by then it's far too late! No need to go other site. Really this site is Awesome. I like it very much. you made nice post to get knowledge. I am really impressed. I want to see your post regularly. I hope you will make more post. Thank you so much.